by Elizabeth Esten Will Ferrell is a name now synonymous with hilarious comedy films. Whether it be Anchorman or The Other Guys, Ferrell has been mastering his comedic chops ever since his run on Saturday Night Live in the early 2000s. 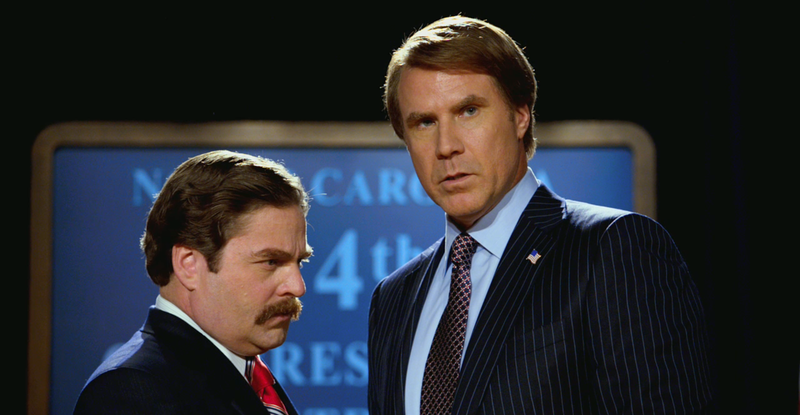 Continuing a distinct style that toes the line of taste, Ferrell and writing partner Adam McKay tackled the instability of the American political system in 2012, involving a team of great actors to do so. But did they succeed in reaching their satirical goals? In North Carolina, Cam Brady (Ferrell) is a clueless congressman of the 14th district running unopposed for his fifth term. After a scandal breaks out and Brady begins dropping in the polls, a pair of corporate overlords called the Motch Brothers (Dan Aykroyd and John Lithgow) take the opportunity to recruit a patsy to run for the position. Enter Marty Huggins (Zach Galifianakis), a member of the local tourism board, who goes along with the Motch Brothers’ plot in order to appease his father (Brian Cox). As the election cycle continues, Huggins and Brady fight for the top spot in the district, getting into various shenanigans along the way. Like many comedies from this team, the plot is there simply to tie individual humorous sequences together. The movie largely consists of Brady and Huggins trying to outdo each other at every turn, with gags ranging from the accidental punching of a baby to a fight breaking out over one of Brady’s childhood projects. The plot points are what keep all the sequences cohesive within the narrative, and because the story is so basic, the film never feels disjointed. While this can get dry in spots as McKay and fellow screenwriters Chris Henchy and Shawn Harwell toy around with more offensive and outlandish humor, the film keeps you laughing and cringing at the same time. But what really makes the gags effective is the characters and performances. In comedies of this nature, the characters are what you remember the most after the credits roll. Ferrell plays Brady as a stereotypical Southern congressman with an ego the size of the state he represents. He’s reminiscent of Ron Burgundy (Anchorman), but unlike Burgundy, Brady lacks the humanity to get the audience to sympathize with him and forgive his shenanigans. This would have been fine if the script framed him as more of an antagonist for Huggins, but the movie desperately wants us to feel bad for him and all the “hardships” he goes through. The problem is that Brady does nothing to make us care for him at any point. On the other hand, Galifianakis as Huggins works magic in what could have been an unremarkable role. His comedic timing is impeccable throughout, and his accent never grates. He plays up his outsider persona, but he is much more sympathetic than Brady ever tries to be. You feel for Huggins and his need to improve the county and you want him to overcome the control that the Motch Brothers have over his life. He reminds me a lot of Bernie Sanders, with his connection to the everyman and his understanding of the great need for change in a corrupt political climate. He keeps an optimistic view of the world and his chances of winning the position, no matter how slim those chances can get. The supporting cast is equally fantastic, with the likes of Jason Sudeikis, Dylan Mcdermott and then-unknown Thomas Middleditch shining in roles both big and small. Creating political satire that isn’t skewed toward one particular party is a difficult task for any screenwriter, as political bias will always pop up in the story no matter how hard one tries to stay neutral. The valiant thing about the screenplay for The Campaign is that it doesn’t criticize the tactics of Republicans and Democrats, instead going after the political process in general and the lengths people go to please the public just to get that extra vote. The Motch Brothers (and by extension Dylan Mcdermott’s campaign manager) do everything conceivable to make Huggins appear as your classic American politician, including replacing his pugs with golden retrievers and making his wife get a Hillary Clinton haircut. Meanwhile, Brady is trying to keep his family unit from falling apart at the seams, just so he can retain some semblance of power in his life. The parties that each of these men represent are irrelevant to the overall story and themes (though there is a grand irony in Huggins running on the Republican ticket). The movie imparts the message that this false image created by corporations is not a way of life, as we can see in the case of Brady. Authenticity, as seen in the philosophy of Huggins, is the way to not only please others, but also live a satisfying life. It’s handled well by the script and actors, which keeps the film compelling even when the gags get old. The Campaign is a fun political comedy with great performances and a solid evocation of themes. While the jokes can be hit or miss, the film is an enjoyable ride without a deep-seated bias that could alienate certain viewers. It’s not Ferrell’s best work, but it’s still a good time all around. Tags: Election Series 2016, Elizabeth Esten. Bookmark the permalink.